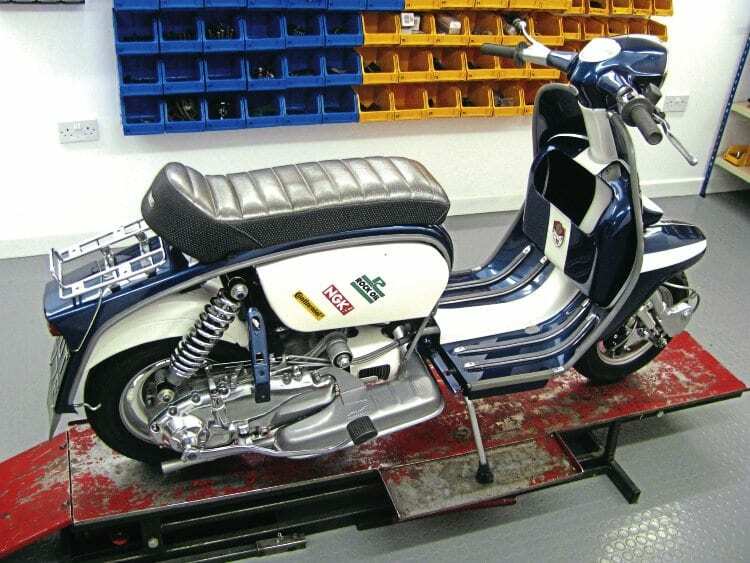 Ever since the Lambretta was first produced it has been subject to the whim of owners trying to enhance its performance. Over the decades there have been countless tuners and developers who’ve tried to squeeze as much power as possible out of the iconic Italian machine. 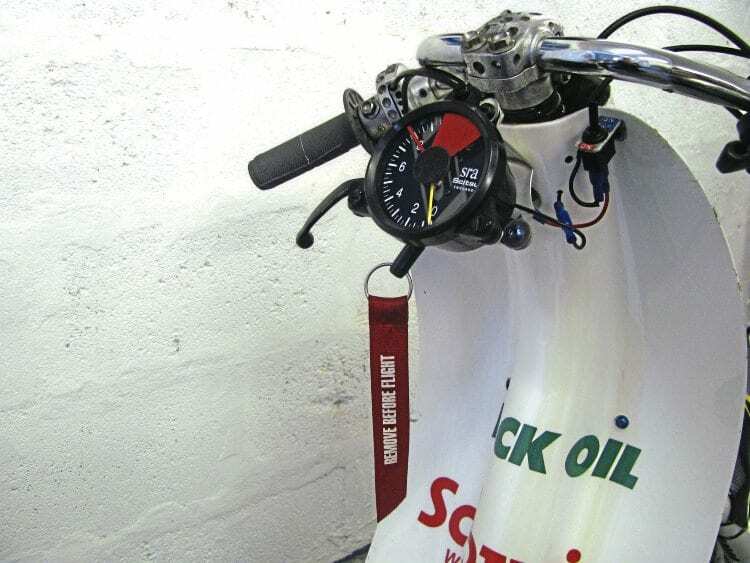 Many products have also been produced which, one way or another, are designed to make your Lambretta go faster. The majority of these are engine based and revolve largely around the cylinder, top end, exhaust and carb area. The idea? Create as much power as possible to make it go faster. Many thousands of pounds can be spent on an engine to achieve this, and quite often this is as far as it is taken. However, why spend all that time and money, to produce more power but not fully utilise all of the available potential? Performance — how do you achieve it? There are many different aspects to achieving better performance; some costing lots of money, some not so much. Some are complicated, some less so. It can be anything from power to weight ratio to frictional losses. All play an important role in enhancing the power created in the engine. Some changes only make a slight improvement compared to others that make significantly more. 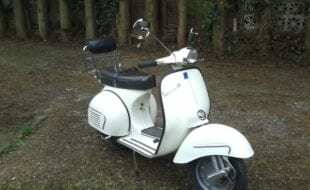 Even so, the cumulative total can contribute to a noticeable increase in the speed and acceleration of your Lambretta. A big fuel tank ideal for touring – but just how much is it weighing the machine down? Often the solution is simple in both its design and execution and easy to do. Some of the more complicated solutions, however, need more thought and should be done during a rebuild. A lot of the time it is easier to just build your project rather than look at ways of enhancing the performance that can slow the build. The question remains, how far you want to take the project and the satisfaction you get upon completion? The ‘street racer’ is as popular as ever, with great examples been turned out year after year. Certainly anyone building one can attempt to make it exactly that, a pure street racer. It may be that you are taking it to the track or circuit, to race or sprint. In theory though it applies to anyone who owns a scooter, whether it’s highly tuned or totally standard. 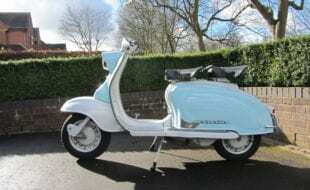 As this series unfolds, it will be plain to see that some of the principles won’t necessarily apply to the more factory specification looking Lambretta. The reality is though, any of the ideas shown can be executed regardless of the engine’s power output. A Lambretta producing 10bhp can still utilise some of these applications to make it more efficient — so if your machine falls in to this category don’t think you can’t make changes. 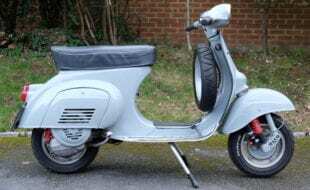 The problem with Lambretta performance and solutions to improve them is they are quite often missed. The reason why is the majority of the time they are only looked at from a Lambretta point of view. That is the wrong direction to take and limits the choice of ideas you can use. 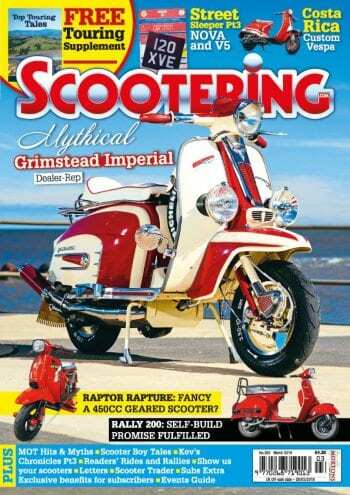 You must remember that the Lambretta is a chain driven two-wheeled vehicle. So is a MotoGP bike which has had millions of pounds and thousands of man hours spent on developing its performance. 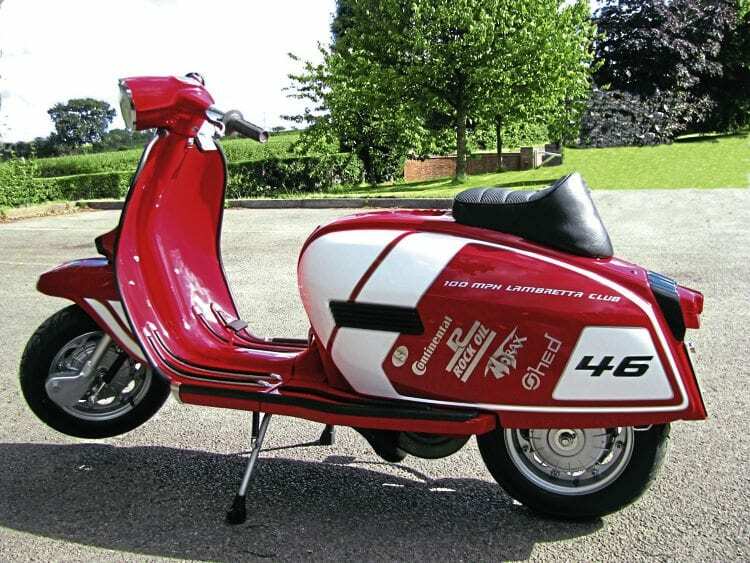 Of course not every idea of a MotoGP bike is usable on a Lambretta, but some are. So too are a lot of the principles. Just because the components are not interchangeable, doesn’t mean the theory of it isn’t. Frictional forces in this front wheel are possibly slowing it down. It’s not just a MotoGP bike that you can compare ideas with. It can be anything from a Formula One car to a racing lawn mower for that matter. 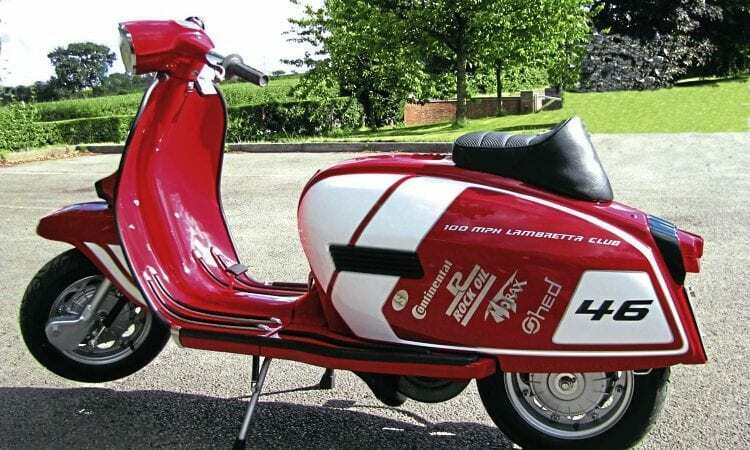 Somewhere someone with a racing machine, whatever it is, will have come up with an idea that might be translated on to a Lambretta. A Formula One car is constructed from carbon fibre; a motorcycle uses a cassette clutch; so too can a Lambretta. It’s this way of thinking that can expand the ideas and methods you can use and, with careful research, improvise ways of doing it. 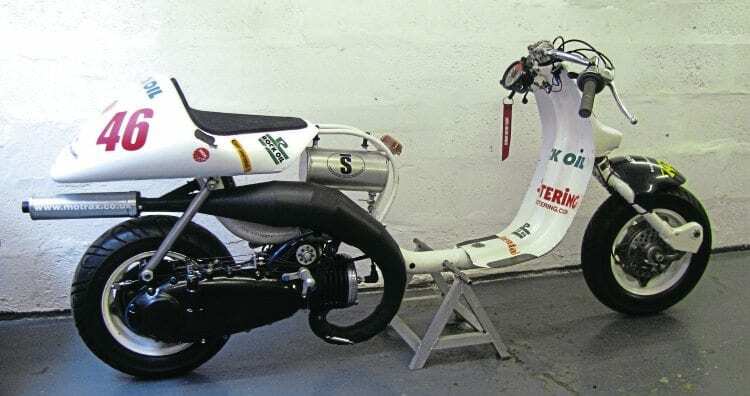 The more you look at other racing machines the more you will see it is possible to develop ideas for your Lambretta you didn’t think of beforehand. 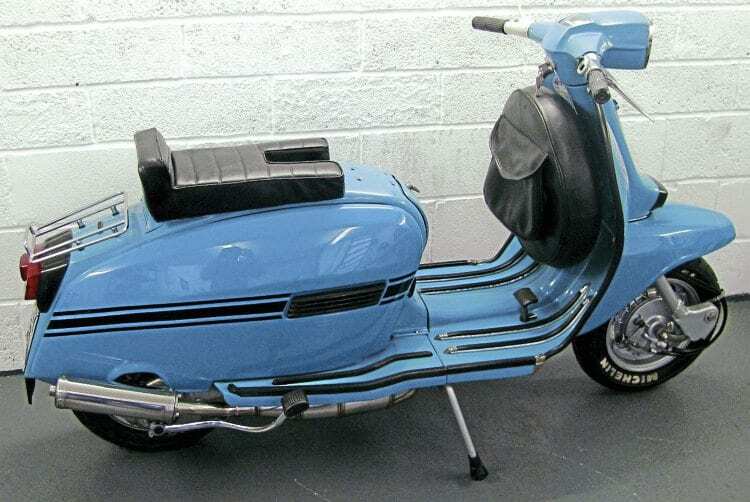 Sometimes you can come up with an idea, but are either unsure it will work or how to adapt it to suit a Lambretta. There is a great saying: two heads are better than one, and when looking at ways of improving performance that philosophy is entirely true. It may be that you are building some top secret, record-breaking, machine so want to keep your ideas close to your chest. In the main though that is not the case so discuss your ideas either in the public domain or with others that share the same common goal. You may have a good idea but are unsure exactly how to execute it. By openly discussing it, someone may come up with the perfect solution, one you couldn’t see beforehand. Remember, people take great pride in providing the answer or helping in some way to creating an idea that works. 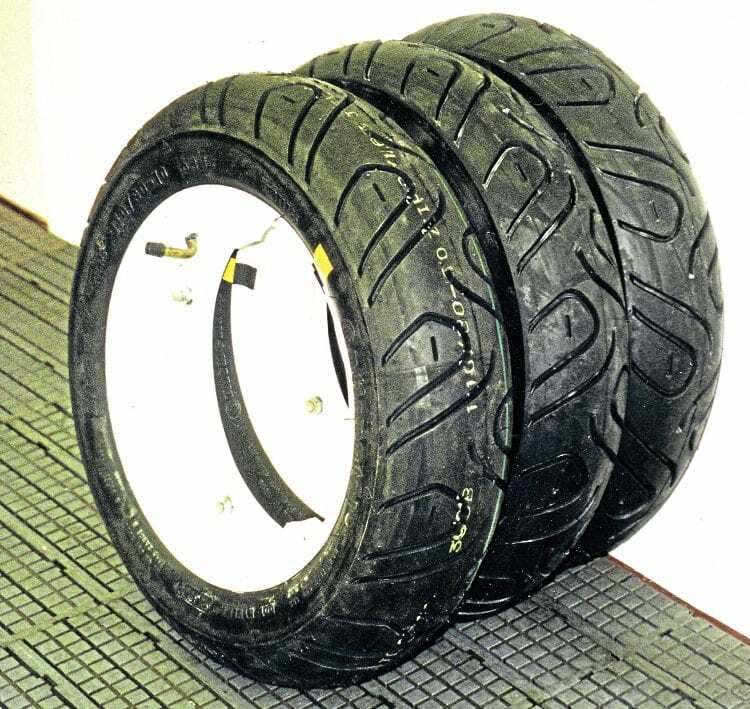 Tyres can play an important role not just in how much grip you have but how efficient the running surface is. Don’t be scared to share your ideas, however extravagant they are. Some will mock your ideas but others will see potential in them and will be willing to help you succeed. Not every idea you think of will work but don’t let that put you off. Look at it like a Formula One car; at the beginning of the season a team will unveil its latest car but spend the rest of the season trying to make something supposedly perfect even better. Plenty of power can be created in the top end but just how much has been lost before it gets to the back wheel? Quite often, previously unheard of products of ideas come on to market with claims to greatly enhance the performance of your machine. Anything previously unproven which it is suggested can considerably improve performance in one single change is, more often than not, too good to be true. If it makes claims to “significantly boost performance” chance are after fitting you will notice no improvement whatsoever. Research a product and try to find as many reviews as possible before deciding to part with your hard earned cash on it. There are proven products out there, which we will go on to discuss. 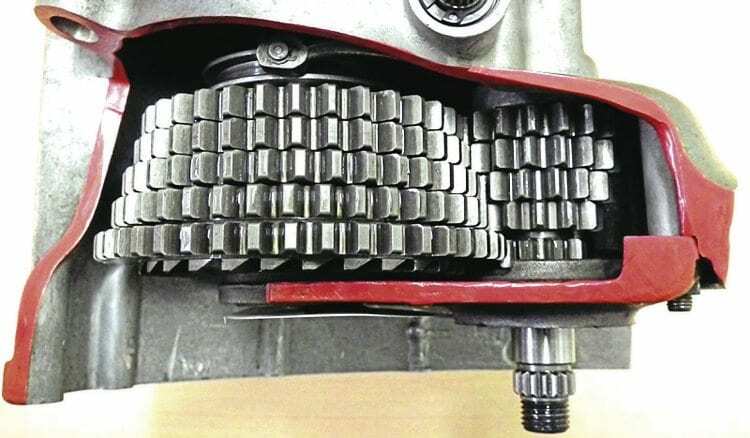 Correct gearing to match your power characteristics is vitally important to make sure you are getting the most from your engine. If it does what it says then you will see them everywhere on other people’s machines. 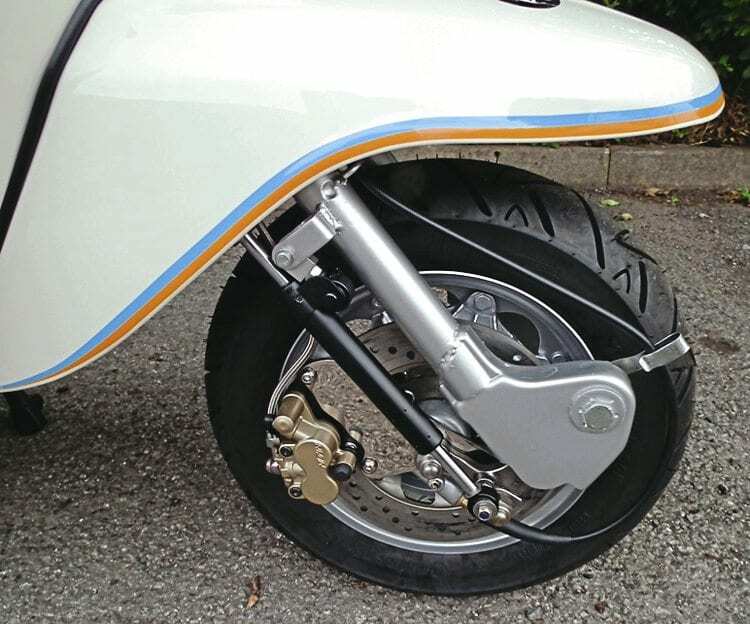 Over the years there have been many ideas aimed at improving Lambretta or scooter performance in general. Many now reside in the failed products hall of fame (idea for another series!) and that’s where they should stay. 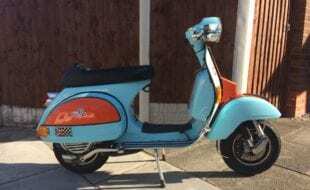 The biggest mistake we all make when trying to improve the performance of the Lambretta is doing too many things at once. It doesn’t matter what you change as long as you do it one at a time. For instance, you alter a tooth on the front sprocket to change the gearing while at the same time you change the jetting settings. You now go faster, but which one has improved the performance? The answer is you can’t be sure. 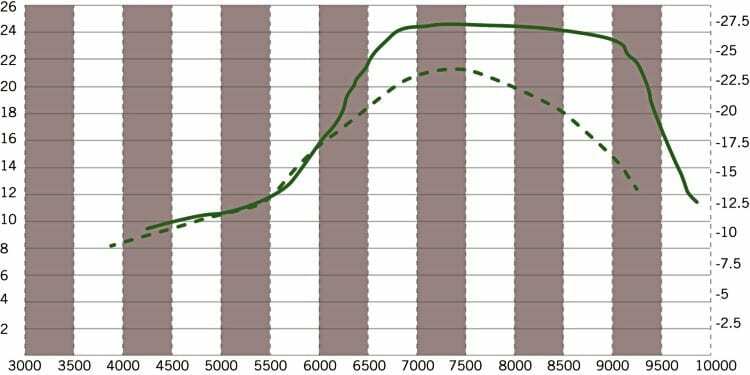 Understanding a dyno graph correctly goes hand in hand with utilising a rev counter to help understand where the usable power is. What if one has made it go faster but one made it go slower? You don’t know which change has done what. It can be a rather laborious process but it is the only way of knowing if that modification has worked or not. During my third season of sprinting, a whole host of changes had been made to the machine to make it go faster, yet the result was it was slower than the season before. Not only was a great deal of money wasted, but there was no way of knowing which had worked and which had not. That resulted in my having to start from scratch all over again and realizing that the only way forward is to make one change at a time. One thing that will help, not only when trying new developments out but also future ones, is to take careful notes. When you make any changes write down if it worked or it didn’t or what improvement it made. Not only will you know whether or not to use that idea in future on another project but also it will build up a pattern of which direction to take development in. Make notes of any ideas you think of, certainly if you are at a race meeting or show looking at other machines. It’s easy to think of on the day when you see something, but easy to forget maybe a week or so later when you go to work on your own machine. We live in an age of camera phones that can take good high resolution images. Take a picture of what you see — that way you have a visual record which is as good as taking notes, if not better. With years of development and may resources to hand, anything can be possible when it comes to unlocking the potential of a Lambretta. As an example, if you decide to remove weight from any component, make a log of it. Record what it weighed before and afterwards so you know the exact difference. That way, over the course of time you will know how much lighter your Lambretta is in total over what it was earlier in development. This is important when working out power to weight ratios. By having all this information to hand, you will be able to see exactly how much you have improved performance from any period in the past. 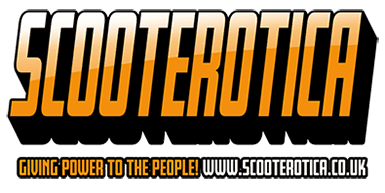 As you start to improve the performance of your scooter and more importantly start to notice it out on the road, you will want to develop it even further. This can be the point when rational thinking goes out the window, as you seek any improvement possible. Remember the wholesale early changes will have been had, those which give the biggest improvement in performance, so now comes the point where only small steps are made and the ideas to improve harder to find. This is where you need to be careful as you can start to come up with elaborate and wacky ideas because you have started to run out of avenues to explore. Don’t be afraid though, just because an idea seems a bit pie in the sky doesn’t mean it won’t work. 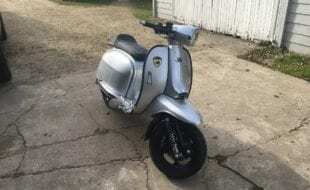 Even though this Lambretta is fairly standard it doesn’t mean it can’t benefit from modifications to enhance its true performance. Where you have to remain confident is when an idea simply doesn’t work. If that is the case, pick yourself up and start all over again and certainly don’t let it put you off. You can look at any type of racing machine, knowing that it has got to that level of performance through hard work, remembering that along the way some of the ideas on it will have been thrown on the scrap heap. Development is a long and sometimes laborious process but if you don’t try you can’t succeed. Quite often it can be funny to look back at some of the things you tried that didn’t work. 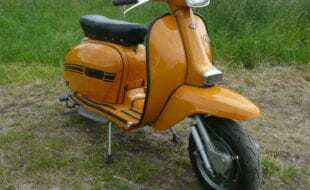 It can also give a great sense of pride as you see just how far you have taken your Lambretta and improved it. Finally the most important thing is to make sure you are prepared for each job you are going to undertake. Tools of course are important and I’m sure we don’t need to go on about this, it’s simple: only start something if you have all the equipment necessary to finish it. Space is also important, certainly if you are removing excess weight which requires drilling or grinding for instance. You don’t want to make a mess of your garage or workshop, filling it full of grinding dust or swarf. Make sure if you are making something out of aluminium, as an example, that you have enough including extra if you make a mistake and have to start again. Take time and plan everything before you start — that way you have less chance of making a wrong decision. Last but not least, take great pride in what you are doing and enjoy the process, the more you do the better and more rewarding the end result will be. With the groundwork out of the way, we can start off the key parts of this new series. We will kick off with the engine and transmission, covering everything from power loss in the drive chain to getting the gearing correct. Stay tuned.